Are you ready for a big, thick juicy steak in between all the holiday fare? I did a couple of dumb things: First, I thought I'd use a cooking spray on the broiler pan. Then I put the steaks on the pan in the oven with the broiler preheated; without thinking, I closed the oven door (instead of leaving it cracked open)...the worst mistake!!! Before I knew it, my home was filled with smoke; and I had to open the sliding glass doors for the place to vent. It was very cold outside!! You would have thought I was a novice cook! Before downsizing, and having the restrictions on grilling in our current community, we had a gas grill which we used until it literally fell apart. My husband was often spotted grilling outside in the rain or snow. Nothing beats steaks cooked on an outdoor grill!! 1. 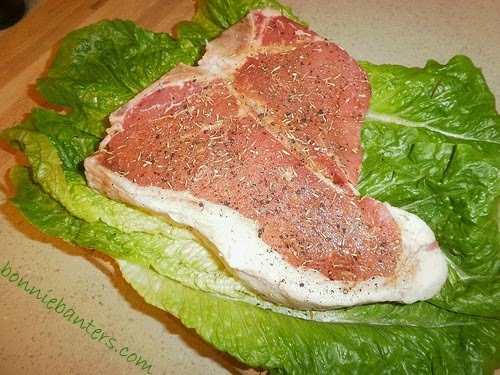 Dry each side of the steak with a paper towel. 2. With the back of a spoon, rub in about 1/2 tsp. Worcestershire sauce on each side. Use your favorite method of grilling or cooking and throw in a baked potato and salad with a crusty bread. Enjoy! I'm rebelling! Want to join me? I'm fed up with the American illogical placing of commas and periods inside quotation marks, regardless of the situation (other than a letter or number). I'm a very logical person; therefore, I have great difficulty accepting the American practice. The British place commas and periods logically when quotation marks are involved. My teachers must have all been British! I'll try to be consistent, since apparently that's the most important thing. What do you think? Interesting - As a result of historical accident: When type was handset, a period or comma outside of quotation marks at the end of a sentence tended to get knocked out of position; so American printers, preferring convenience, placed the periods and commas inside the quotation marks. Logical British printers continued to risk the misalignment of their periods and commas. "Quotation Marks: Where Do the Commas and Periods Go--and Why?" Tomatoes are accustomed to controversy (since not everyone agrees on the pronunciation of their name). No, I want to go "outside".